Linen fabric is produced from fibre extracted from the stems of the flax plant and was an important textile before wool and cotton. The earliest example of preserved linen appears to be a needle-netted linen headpiece from Nahal Hemar Cave in Israel from 8,500 years ago (see Barber), and Swiss Lake Dwellers used a native flax to make cloth 5-6,000 years ago. Linen was the preferred textile of the Ancient Egyptians who used it for clothing, bed linen, shrouds for mummies and for ships’ sails. 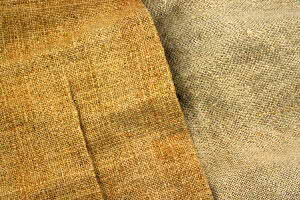 The earliest Egyptian linen cloth dates from the Old Kingdom but flax appears to be have been grown for linen about 5,000 years ago in the Early Dynastic period. Egyptian linen was widely exported throughout the Mediterranean by Phoenician traders and was used by Greeks and Romans for clothing and ships’ sails. 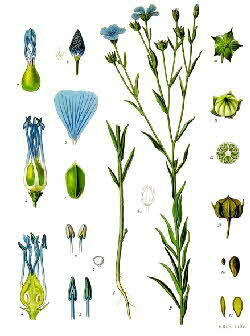 Charlemagne strongly encouraged flax production and Flanders became a centre of flax production in medieval Europe. Rita Buchanan says that women in nearly every household in northern Europe were engaged in spinning flax in the Middle Ages. According to “Life in Flanders in the 18th and 19th Centuries”, there were 300,000 home-based spinners and weavers in Flanders at the beginning of the 19th century but there were only 152 spinners and 721 weavers still working in 1896 due to the industrial revolution. 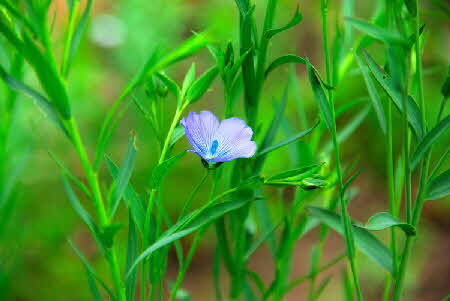 Cultivated flax (Linum usitatissimum) is an annual of temperate climates, especially of northern Europe. Separate varieties are grown either for the fibre or for the seeds that are used in linseed oil production. The plant grows to about 1 metre in height in 3-4 months and has attractive pale blue flowers at the tips of the stems. After flowering, the whole plant is pulled to obtain the maximum length of fibre. In the traditional process, the flax stems are tied into bundles and hung out to dry. When the stems are dry, they are combed with a rippling rake to remove the seed pods. The stems are then retted (that is, rotted) either by laying them in a damp field for a couple of weeks, where they ret in the dew, or by leaving them in standing water for a few days. The retted stems are rinsed and dried before breaking them with a flax-brake and cleaning them by scutching. 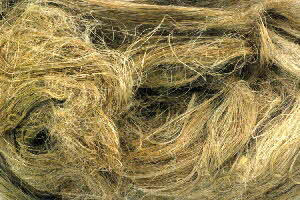 The fibres are then combed on hackles to produce long line fibres that can be spun, called line flax. The short fibres that are combed out are the hackle tow or flax tow and are carded and spun into coarse yarns and thread. This whole process is well described and illustrated in a YouTube video prepared by the Frontier Culture Museum of Virginia that is accompanied by a second video on the spinning of flax (see references) and there are diagrams in the Life in Flanders references. Read more about flax in Christian and Johannes Zinzendorf’s The Big Book of Flax.